Sanctes first saw the light of day at Montefabro, a little town not far from Urbino, Italy. Since his parents were among the most prominent citizens of that place, they sent their son to Urbino to pursue higher studies as soon as he had grown to young manhood. There, as at home, he lived an innocent life and applied himself so diligently to his studies that the highest hopes were entertained concerning him. When he was twenty years old, an incident occurred that changed the entire course of his life. An enemy pursued him with drawn sword. Sanctes fled. Reaching home, he found that his pursuer was still following him. He then grasped a weapon that was within reach and dangerously wounded his pursuer with a slash on the thigh which proved fatal a few days later. Although the young man had acted in self-defense, he was nevertheless inconsolable over the outcome, and his conscience grievously tormented him. In order to appease this trouble of conscience, he resolved to leave the world and lead a life of great austerity in the Franciscan Order. He chose to enter as a lay brother, and distinguished himself among his associates by humility and penance. The most disagreeable and lowly tasks were the most dear to him. After a time his superiors appointed him novice-master of the lay brothers, and Sanctes filled this office with remarkable success. However, he soon begged so humbly to be relieved of it that his request was granted. He preferred to be subject to others rather than to rule over them. In spite of the severity with which he treated his body, he still believed that he had not yet atoned enough for the fatal wound he had inflicted on his enemy, and begged almighty God to allow him to make adequate reparation for it. His prayer was heard. A very painful ulcer formed on his thigh exactly where he had wounded his assailant. He suffered the same pains that the man did, and patiently endured them with resignation until the end of his life. But God also granted Blessed Sanctes of Montefabro great consolation ad special graces. One day he was busy in the kitchen when the bell rang for elevation at holy Mass. He knelt down to adore the Blessed Sacrament when suddenly the walls opened and he was able to see the Sacred Host on the altar. 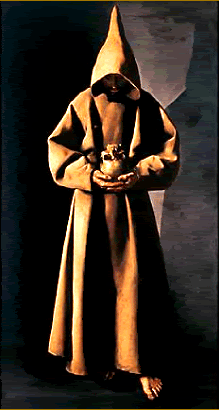 Like his holy Father St Francis, Sanctes had an extraordinary power over animals. Once he had taken a mule with him to the forest to get some wood. While he was gathering the wood, the mule wandered into a ravine to graze. When the brother returned and looked for the animal, he found that it had been killed by a wolf which was still feasting on him. The holy brother reproached the wolf for having torn the convent’s beast of burden to pieces and told him that henceforth he must perform that animal's duties. The wolf followed the brother like a lamb and thereafter allowed himself to be used as a beast of burden. Other miracles are also reported of Brother Sanctes which caused his name to be revered even in distant places. He was not concerned, however, with the honors rendered him by men. Blessed Sanctes of Montefabro endeavored only to serve his God and looked for no other reward but that which heaven would grant him. Blessed Sanctes of Montefabro had not long to wait for this reward. He was in his forty-fourth year when he died in the convent of St Mary of Scotaneto on the vigil of Our Lady’s Assumption, August 14, 1390. Pope Clement XIV approved the veneration given to him sice his death.